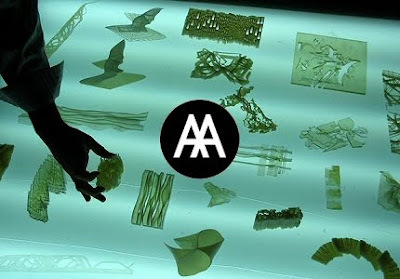 AA CSI 2010 is the second of three annual summer workshops focused on developing innovative methods for synthesising drawing and 3D printing. Working with Objet Geometries high resolution, multi-material liquid 3D printing technology, participants will be involved in an intensive ten-day program of making and testing 2D, ‘thick 2D’ and 3D digital printing techniques to invent architectural surfaces. The workshop program is inspired by British pioneers of art and architectural representation – Joseph Gandy, Robert Adam, James Stirling, David Hockney and John Outram – and informed by Israel’s unique cultural heritage of textiles and ceramics. The workshop is the testing ground for AA Intermediate Unit 9’s ongoing experiments to blur the boundary between drawing and 3D printing. The objet trouvé, exquisite corpse and other Surrealist and Dadaist techniques form the basis for these investigations. The workshop’s objective is to deliver an atlas of prints (working with measured drawings from non-architectural disciplines) from each participant (a ‘3D takeaway’) that they will incorporate into future projects and publications, giving the workshop a wide-ranging material and intellectual influence. Participants will work in at least two of four different AA -led design units over the ten days. The teaching staff also includes Eran Neuman and Aaron Sprecher of Open Source Architecture. In addition to advanced software tuition, there will be regular evening lectures (invited speakers include Neri Oxman and Erez Ella) and workshops including a hands-on working session with Objet Geometries chief software engineer, Yossi Abu. The final jury will be a day-long presentation/exhibition at the ZeZeZe Gallery in the Tel Aviv port. Rhino, Grasshopper and Maya will be the key software tools used at the workshop.